← How do I find the words?…. Driving through my native Ireland, I remember spotting a road sign in The Burren region of County Clare, with the words “Ah, will ye ever” painted above the word ‘Stop’. I often wondered if it was for the benefit of tourists who dash through en route to Connemara or Kerry, missing the National Park’s limestone wonders which gleam like the biggest emeralds of all. The Welsh ferry ports should have a similar sign for all those Irish people who dash off the ferry en route to England and beyond. Because, believe me, you really need to stop. With just a few days to spare, I took on a few different sections of the Path. Staying at Preseli Venture Eco Lodge, a vibrant, family-run activity centre where I had first stayed a couple of years ago when I first explored the coast from the water that time, sea kayaking and coasteering. They welcome everyone here like long lost friends and celebrate Pembrokeshire’s wealth of natural heritage with such infectious enthusiasm that I thought this would be the perfect base for a bit of solitary walking this time. And as part of their Self Guided Walking Break, they also serve vats of wonderful home cooked food all day, so I hit the roads with a belly full of breakfast, a packed lunch, in the knowledge that a big curry or casserole was waiting for me each night. Preseli is located 11 kms from Fishguard, where the owners will pick you up if they can although it is a quick cab or bus ride if you are coming by foot. And I really recommend leaving the car behind. It’s much cheaper, you really slow down and there is a brilliant all year round tourist bus service to get you to and from the favourite spots and which you can hail at any spot along its route. 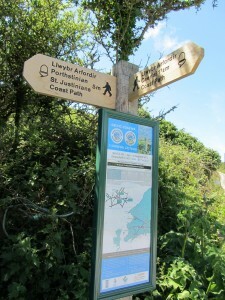 For more details and timetables see walkingpembrokeshire.co.uk. 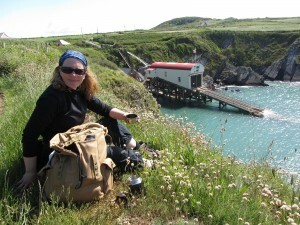 On the first afternoon, I shook off my journey jaundice by fitting in a three hour walk along the coast Path from nearby Aber Mawr beach heading south to Trefin, where I caught the bus back to the campsite. The weather was drizzly enough to get my walking boots suitably muddy and my new waterproof trousers tried and tested. However, in spring this whole coastline erupts into colour with pink Foxgloves, white Ox-eye Daisies, blankets of yellow Kidney Vetch and Wild Primrose dotted with the purples of wild thyme, uplifting the spirit no matter what the weather is doing. The sky was cloudless on day two, however, when I started out on my 19 kms circular, and nearly all coastal, route around St. David’s which, although it is the smallest city in the UK, has one of the largest collection of coves and cliffs on its doorstep, most of which are only accessible by foot. I took the bus again to St. David’s, where the cathedral clock struck nine as I headed up a long, narrow road where the grass still grows in the middle, to the expanses of Whitesands Bay. Heading south again, the Coast Path overlooks Ramsay Island , a bird reserve and favourite hangout for seals, dolphins and porpoises (ramseyisland.co.uk) although, as I dipped in and out of tiny uninhabited bays, I only spotted a few cliff climbers, kayakers and a couple of fishing boats. It never gets busy here really, except around the historical honeypots of St Justinian’s Bay, with its ancient chapel and a stunning red and cream lifeboat station with funicular system designed to transport people and good up and down the cliff, or the turquoise inlet of Porth Clais with its ancient lime kilns built into the harbour walls (and a much needed coffee and ice cream kiosk). The only other company en route was the odd smiling hiker pursued by some of the choughs, cormorants and stonechats which favour this stretch of coast. Not surprising, therefore, that the retreat at St Non’s is still used as such, with yoga, meditation and religious retreats all part of the mix (stnonsretreat.org.uk). This was the birthplace of St. David, Non being his mother, and I must admit that even though I popped into the chapel in search of shade rather than spirituality, I found this a moving place indeed. My last day of walking took me around Strumble Head, just 5 kms from Fishguard, where wild ponies are let out to pasture in order to keep these remote rocky slopes and paths clear of bracken and gorse, and where an imposing white lighthouse issues warnings to the incoming ferries. This is where I realised that I really didn’t want to leave this Path at all now. I had become a headland addict, wanting ‘just one more’ before giving up. However, there are plenty more fixes to be had now as, following on from Pembrokeshire’s success, all 1400 kms of the country’s coast were officially opened to walkers in May of this year, known as the Wales Coast Path. So now walkers don’t have to stop at all, they can just keep going and going. Rosslare to Fishguard €32 one way, or bring your bike for €10 one way. For more information on their excellent rural bus schemes linking the Pembrokeshire Coast, see walkingpembrokeshire.co.uk or visitpembrokeshire.com. 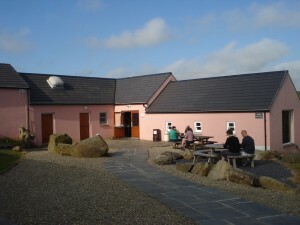 Catherine stayed at Preseli Venture Ecolodge and Activity Centre (preseliventure.co.uk, Tel: +44 1348 837709) open to individuals mid-week for Sterling £39 pn b&b, or £59 pn fully catered. 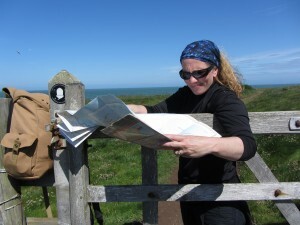 Or check out their self guided walking holiday which is aimed at hikers doing their own thing. Take a break from hiking and explore the Coast from the water on one of their activities, from £55. Coasteering is a must. This entry was posted in Articles and tagged adventures wales, coasteering, ecotourism Wales, ferry to wales, green holidays wales, green Wales, hiking in Wales, holidays in wales, hostels in Wales, pembrokeshire, preseli, responsible tourism wales, travelling form Ireland to wales, wales. Bookmark the permalink.